An elective monarchy is a monarchy ruled by an elected monarch, in contrast to a hereditary monarchy in which the office is automatically passed down as a family inheritance. The manner of election, the nature of candidate qualifications, and the electors vary from case to case. Historically it is not uncommon for elective monarchies to transform into hereditary ones over time, or for hereditary ones to acquire at least occasional elective aspects. Many, if not most, kingdoms were officially elective historically, though the candidates were typically only from the family of the deceased monarch. Eventually, however, most elected monarchies introduced hereditary succession, guaranteeing that the title and office stayed within the royal family and specifying, more or less precisely, the order of succession. The kings of Macedon and of Epirus were elected by the army, which was similar in composition to the ecclesia of democracies, the council of all free citizens. Military service often was linked with citizenship among the male members of the royal house. In the ancient Kingdom of Rome, the kings were elected by the Assemblies. Once the Roman kings were overthrown, there remained an absolute prohibition for royal establishment in the Roman constitution, a prohibition which formally remained in place during imperial times, both Roman and Byzantine. In practice, however, Imperial Rome was a monarchy. During the Principate (27BCE to 284CE), which was the foundational stage of Roman emperorship, Roman monarchs would often take care to disguise their de facto position with the de jure apparatus of republicanism. This was particularly the case for Augustus, the first Emperor, who established the Principate. Whilst given many titles (including "Augustus", i.e. "majestic") he described himself as "princeps senatus", or merely "first among senators". The illusion of being elected from the Senate continued when Tiberius succeeded to the purple. Whilst over time the principle weakened as republican government passed into distant history to the effect that the Empire became, functionally, an absolute monarchy the office of Roman and Byzantine emperor remained vaguely elective (albeit with the election procedure never strictly defined, but generally understood to be a matter for the Senate). For instance, whilst the first five Emperors were all descended from Julius Caesar, in each case their position was proclaimed, not inherited as of right. Claudius, the fourth Emperor, in particular stands out, being "elected" to office once the Praetorian Guard had made it clear he was their candidate. Accordingly, heredity never was, and could never be, formally established in law. And whilst the later, more overtly authoritarian Dominate period further stripped the republican veneer from the constitution, Emperors succeeded by a mixture of proclamation by the Legions or Senate as much as by blood (though sons did succeed fathers). In order to bypass the prohibition on heredity and ensure dynastic continuity, many reigning Byzantine emperors had their heirs crowned co-emperor so that the throne could not be considered vacant at their own death and thus the need for succession by election would not arise. The Holy Roman Empire is perhaps the best-known example of an elective monarchy. However, from 1440 to 1740, a Habsburg was always elected emperor, the throne becoming unofficially hereditary. During that period, the emperor was elected from within the House of Habsburg by a small council of nobles called prince-electors. The secular electoral seats were hereditary. However, spiritual electors (and other prince-(arch)bishops) were usually elected by the cathedral chapters as religious leaders, but simultaneously ruled as monarch (prince) of a territory of imperial immediacy (which usually comprised a part of their diocesan territory). Thus the prince-bishoprics were elective monarchies too. The same holds true for prince-abbacies, whose princess-abbesses or prince-abbots were elected by a college of clerics and imperially appointed as princely rulers in a pertaining territory. In the Crusader Kingdom of Jerusalem, the kingship was partially elected and partially hereditary. During the height of the kingdom in the mid-12th century there was a royal family and a relatively clear line of succession. Nevertheless, the king was elected, or at least recognized, by the Haute Cour. Here the king was considered a primus inter pares (first among equals), and in his absence his duties were performed by his seneschal. Originally, the Kings of Sweden were elected by all free men at the Mora Thing. Elective monarchy continued until 1544, when the Riksdag of the Estates designated the heirs of King Gustav Vasa as the heirs to the throne. The Danish monarchy was also officially elective, although the eldest son of the reigning monarch was usually elected. This continued until 1660, when a hereditary and absolute monarchy was instituted by Frederick III. Though the monarchy of Norway was originally hereditary, it too became elective in the twelfth and thirteenth centuries. Candidates had to be of royal blood, but the kingship was elected by a council of noblemen, rather than automatically passing to the eldest son. In 1905 Prince Carl was elected King of Norway, after the male population in an election decided Norway should still be a monarchy. The Scandinavian kingdoms were united under the Danish crown by Margaret I of Denmark in 1389, but many of her successors had the united kingdoms split up as Sweden elected a different king than Denmark and Norway upon succession. The election was usually contested through a Danish invasion of Sweden until Christian II of Denmark after his reconquest of Sweden had all those voting against him executed in the Stockholm Bloodbath (1520), which ended all support for the Danish king on the Swedish throne. In 1810, the Swedish Riksdag elected the French Marshall Jean Bernadotte to be the new Crown Prince, since it was apparent that the Swedish branch of the House of Holstein-Gottorp would die with the childless King Charles XIII. Bernadotte eventually ascended the throne as Charles XIV John of Sweden and founded the still current House of Bernadotte. In this case the elective aspect in the choice of Monarch was especially prominent, since Bernadotte was a French commoner with no previous connection to Sweden and not the most remote of dynastic claims to the Swedish throne – his being chosen derived solely from urgent political and military considerations of the crisis time of the Napoleonic Wars. In Poland, after the death of the last Piast in 1370, Polish kings were initially elected by a small council; gradually, this privilege was granted to all members of the szlachta (Polish nobility). 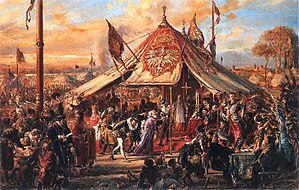 Kings of Poland and Grand Dukes of Lithuania during the times of the Polish–Lithuanian Commonwealth (1569–1795) were elected by gatherings of crowds of nobles at a field in Wola, today a neighbourhood of Warsaw. Since in Poland all sons of a noble were nobles, and not only the eldest, every one of an estimated 500,000 nobles could potentially have participated in such elections in person – by far the widest franchise of any European country at the time. During the election period, the function of the king was performed by an interrex (usually in the person of the primate of Poland). This unique Polish election was termed the free election (wolna elekcja). Since medieval times, the King of Bohemia was elected by the Estates of Lands of the Bohemian Crown. Since 1526, when the Holy Roman Emperor Ferdinand I assumed the Bohemian Crown, it was always held by the Habsburgs, who expected this situation to go on indefinitely. In 1618 the Bohemians chose to exercise in practice their legal right to choose a King at their discretion, and bestowed the Bohemian Crown on Frederick V, Elector Palatine – "The Winter King". However, the Habsburgs regarded this as an act of rebellion, imposed their rule over Bohemia in the Battle of the White Mountain and in the aftermath abolished the Bohemian Elective Monarchy and made exclusive Habsburg rule the de jure as well as de facto situation. The attempt to make Frederick V King of Bohemia is regarded as a catalyst for the Thirty Years War. The Republic of Venice was ruled from 697 to 1797 by a doge, who normally ruled for life, though a few were forced from office. His powers were never those of an absolute monarch, but he was the Republic's highest official and powerful within restrictions and levels of oversight that varied in different periods. The election process began with the Great Council of more than 2000 Venetian aristocrats and employed an elaborate system designed to prevent one family or alliance from dominating the process. It used smaller nominating groups that were reduced in number by the drawing of lots and required a supermajority for election. In the Dutch Republic of the 17th and 18th Century there was the office of the Stadtholder, whose power fell short of those of a monarch, and which was elective. Each of the seven Dutch provinces could separately elect its own Stadtholder and it did not have to be the same person in all of them. In theory anyone could be elected Stadtholder, though in practice it was restricted to members of the House of Orange. There was no obligation to elect a Stadtholder at all, and the leaders of the Dutch Republican faction, such as Oldenbarnevelt and De Witt, repeatedly tried to abolish the office of Stadtholder or leave it vacant – which it was for several decades of Dutch history. Conversely, the House of Orange and its adherents tried to increase the powers of the Stadtholder to approximate those of a Monarch, to make it officially hereditary (which it became in the later part of the 18th Century) and finally to transform it into a full-fledged Monarchy – as it was in 1815. The Sovereign Military Order of Malta, formerly known as the Knights Hospitaller or the Knights of Malta, remains a sovereign subject of international law since it was exiled to Rome from Malta during the French occupation of Malta under the First French Republic. The Order is ruled by the Prince and Grand Master, who is elected for life by the Council Complete of State. The Prince and Grand Master holds the rank of Prince, bestowed by the Holy Roman Emperor in 1607 and holds the precedence of a cardinal of the Church since 1630. The Council that elects the prince includes members of the Sovereign Council and other high-ranking office-holders and representatives of the Order's worldwide entities. The Sovereign Council, including the Grand Commander, the Grand Chancellor, the Grand Hospitaller, and the Receiver of the Common Treasure, aid the prince in governing the order. A system of elective monarchy existed in Anglo-Saxon England (see Witenagemot), Visigothic Hispania, and medieval Scandinavia and in the Principality of Transylvania. Medieval France was an elective monarchy at the time of the first Capetian kings; the kings however took the habit of, during their reign, having their son elected as successor. The election soon became a mere formality and vanished after the reign of Philip II of France. In a much later period of its history, France briefly had again a kind of elective monarchy when Napoleon III was first elected President of France and then transformed himself into an Emperor – which, him being the nephew and heir of the Emperor Napoleon I, was not entirely a surprise. In Ireland, from the beginning of recorded history until the mid-16th/early 17th century, succession was determined by an elective system based on patrilineal relationship known as tanistry. In late 17th and early 18th century England, the Parliament effectively asserted that Monarchy in England was elective - at least as between various contenders with some dynastic claim for the throne. During the Exclusion Crisis, King Charles II strongly opposed any such idea - but following the Glorious Revolution, Parliament did enact the Act of Succession, whose effect was to disinherit in the Stuarts and replace them by the Hanoverians whose dynastic claim was far more remote. In later times, with Constitutional Monarchy well established, Parliament made no further interference in the succession to the British throne. At the start of the 20th century, the first monarchs of several newly independent nations were elected by parliaments: Norway is the prime example. Previously, following precedent set in newly independent Greece, new nations without a well-established hereditary royal family often chose their own monarchs from among the established royal families of Europe, rather than elevate a member of the local power establishment, in the hope that a stable hereditary monarchy would eventually emerge from the process. The first king of Belgium, as well as the now-deposed royal families of Greece, Bulgaria, Albania (unsuccessfully) and Romania, were originally appointed in this manner. On 9 October 1918 the Parliament of newly-independent Finland elected Prince Frederick Charles of Hesse, brother-in-law of the German Emperor Wilhelm II, as King of Finland – but soon afterwards, this move was foiled by the German defeat in WWI and the demise of Monarchy in Germany itself, and Finland opted to become a Republic instead. In Africa, the Mali Empire functioned as both a constitutional and elective monarchy. The mansa, or emperor, had to be approved by the Great Assembly known as the Gbara, despite hereditary claims. The Kingdom of Kongo was a purer example of an elective monarchy, where blood claims had even less pull. Nobles elected a king's successor, and it was common for the successor to be of a different family as his predecessor. This form of elective monarchy existed in the kingdom from its inception in around 1400 until its complete disintegration in the early 20th century. In the pre-colonial period, a number of West African rulers, such as the kings and chieftains of the Ashanti Empire and those of the Yoruba people, were elected from amongst the various royal families of their polities by colleges of noblemen known as kingmakers. This practice has continued to the present day. The ancient Korean kingdom of Silla elected its first king by a conference of tribal and village elders in 57 BC; later, the monarchy of Silla became hereditary in nature. Gopala, the first emperor of the Pala Empire was chosen by independent regional warchiefs in the 8th century. In the Mongol Empire, the Great Khan was chosen by the Kurultai. In the Islamic world the Caliphs, successors to Muhammad, were originally elected by consensus of the community. The first four Caliphs were elected in this fashion as Sunni Muslims believed Muhammad had originally intended before Muawiyah, the sixth caliph, turned the Caliphate into what is known as the Umayyad Dynasty, a hereditary monarchy. In Sunni Islam, the first four elected caliphs were remembered as the Four Rightly Guided Caliphs. They were elected by a process known as Shura. Other monarchs, such as the former Shah of Iran, have been required to undergo a parliamentary vote of approval before being allowed to ascend to the throne. In 1858, the central tribes of North Island elected Potatau te Wherowhero as their monarch. The Tainui tribal elders have continued this tradition and the New Zealand Maori Kingitanga movement alive to the present. The Kingdom of Hawaii could be considered a de facto example. From 1864 until the monarchy was overthrown, it was constitutionally a hereditary monarchy utilizing male-preference primogeniture. However, the Constitutions of 1864 and 1887, and the draft constitution of 1893, all provided that, in the event of the extinction of the royal line, the Legislature would elect a "native aliʻi" as the new monarch and stirps of a new dynasty. In actuality, however, during the entire time from 1864 until the overthrow of the monarchy, the throne was never passed from parent to child, as every Hawaiian monarch who reigned during that period died without leaving issue. Following the 1872 death of King Kamehameha V, a non-binding referendum was held, which William Charles Lunalilo won; he was subsequently elected king by the legislature in 1873. King Kalākaua was elected by the legislature in 1874, after Lunalilo's death. However, when Kalākaua died in 1891, the crown demised to the collateral line of his sister, Queen Liliʻuokalani. Prior to 1864, the Hawaiian King-in-Council appointed the heir to the Hawaiian throne. In the United Arab Emirates, the hereditary emirs of the emirates elects one of themselves as president of the federation. The Tlatoanimeh of the Aztec Empire were chosen by a council of elders, nobles, and priests. He would be selected from a pool of four candidates. An attempt to create an elective monarchy in the United States failed. Alexander Hamilton argued in a long speech before the Constitutional Convention of 1787 that the President of the United States should be an elective monarch, ruling for "good behavior" (i.e., for life, unless impeached) and with extensive powers. Hamilton believed that elective monarchs had sufficient power domestically to resist foreign corruption, yet there was enough domestic control over their behavior to prevent tyranny at home. His proposal was resoundingly voted down in favor of a four-year term with the possibility of reelection. In his later defense of the Constitution in The Federalist Papers, he often hints that a lifetime executive might be better, even as he praises the system with the four-year term. The Empire of Haiti, established in 1804, was also elective. A hereditary monarchy may occasionally use election to fill a vacant throne. For example, the royal family may become extinct; depending on how precisely the succession to the throne is defined in law, several candidates with equally, or almost equally, strong claims could emerge, with an election being held to choose from among them. This differs from a formally elective monarchy in that it is an extraordinary measure, and with the new monarch the succession again becomes hereditary. John of England, chosen as King of England by a council of nobles and royal advisors at the death of his brother, Richard I, in 1199 because the heir by strict primogeniture, Arthur of Brittany, was a child at that time. In Scotland, the Declaration of Arbroath of 1320 asserted the rights of the nobles to choose a King if required. Henry IV of England, chosen by Parliament in 1399 to replace Richard II. Richard was childless, and the Earl of March, the next in line to the throne, was a young child at the time, so Parliament bypassed him in favour of Henry, who had led a revolt against Richard. Michael of Russia, chosen by a Zemsky Sobor (national assembly) in 1613 after the extinction of the Rurikid dynasty and the end of the Time of Troubles. The resulting Romanov dynasty was an old boyar house with close ties to the former royal family, and Michael's father, Feodor Romanov, was at the time a Patriarch of Moscow and All Russia under the monastic name of Filaret, in effect holding a position of interrex. Later, Patriarch Filaret, a skilled politician in his own right, became effectively a co-ruler and sometimes a regent for his weak and not very healthy son. William III and Mary II of England, chosen by Parliament to replace James II. (Mary was James' daughter, William was James' nephew, and William and Mary were succeeded by Mary's younger sister Anne.) Parliament passed laws in the late 17th and early 18th centuries which explicitly excluded Catholics (and thus the male descendants of James II) in the order of succession. In Portugal, on 6 April 1385 in the aftermath of 1383–1385 Crisis, the Council of the Kingdom elected John I, then Master of the Order of Aviz, as King of Portugal. His half-brother Ferdinand I had died without a male heir in October 1383, and different factions made strenuous efforts to secure the throne for Princess Beatrice, Ferdinand's only daughter and Queen consort of Castile and León, or for either of her uncles Infante John, Duke of Valencia de Campos and Infante Denis, Lord of Cifuentes. The Council elected instead the younger (and illegitimate) son of Peter I, thus avoiding a jure uxoris Castilian king. Louis-Philippe of France, chosen to become King of the French by the French Chamber of Deputies during the July Revolution of 1830. Before republics became widespread or default form of modern government, back when self-respecting states operated as monarchies by default, new polities or countries in internal turmoil sometimes selected and invited some person to become their monarch. The selected person might have had little or nothing to do with his prospective kingdom; he might have had associations with a current great power or with a current regional power, or might appear as a true outsider, (hopefully) unbiased in matters of internal politics. (The concept of "invitation" may discreetly gloss over intense lobbying or diplomatic manoeuvring in some cases.) By selecting a foreign prince or aristocrat, nations could expect to gain diplomatic links and a figurehead accustomed to the trappings of courts and ceremonial duties. Newly established states in the 19th and early 20th centuries established trends in the selection and appointment of newly minted monarchs. 862: according to tradition, various tribes of northern Rus' invited Rurik, a chief of their former Varangian foes, to re-establish order: his descendants ruled in Kiev, Muscovy and Russia until 1612. The legend of an invitation echoes the habit of later invitations to Rurikids and others to rule in Pskov and in Novgorod. 1573: The Polish szlachta broke with tradition by looking beyond Eastern Europe for a candidate and electing the French Prince Henry, Duke of Anjou as King of Poland. 1810: Sweden elected the French Napoleonic Marshal Jean Bernadotte as Crown Prince: he became King Charles XIV John of Sweden in 1818. 1831: Belgium selected a German Prince of Saxe-Coburg-Gotha as King Leopold I, the first King of the Belgians. 1832: European Great Power diplomats selected the German Prince Otto of Bavaria to become King Otto of Greece. 1863: The Greek National Assembly elected the Danish Prince William of Schleswig-Holstein-Sonderburg-Glücksburg as King George I of the Hellenes. 1866: Romania elected the German Prince Karl of Hohenzollern-Sigmaringen as its Ruling Prince (he later became King Carol I of Romania). 1870: In the wake of political turmoil in Spain, the Spanish Cortes re-established the Spanish monarchy under a new royal house, electing the Italian Prince Amedeo of Savoy as King Amadeo I of Spain. 1879: Bulgaria elected the Russian-sponsored German Prince Alexander of Battenberg as its reigning knyaz (prince). 1887: The Bulgarian Grand National Assembly elected the Austro-Hungarian Prince Ferdinand of Saxe-Coburg and Gotha-Koháry as Prince (later Tsar) of Bulgaria. 1914: The European powers selected the German Prince William of Wied as the ruler of the Principality of Albania. 1918: The German-occupied Kingdom of Lithuania voted to offer the throne to the German Prince Wilhelm of Urach, Count of Württemberg, 2nd Duke of Urach, who would have become King Mindaugas II. The Belgian monarchy survived despite scandals; the Swedish and Norwegian monarchies have flourished. Most other countries who invited in new rulers have since become non-monarchical republics. Cambodia, where the king is chosen for a life term by the Royal Council of the Throne from candidates of royal blood. The Holy See and the associated Vatican City State, where the Pope is elected in a conclave by the College of Cardinals, generally from among their number. Malaysia, where the Yang di-Pertuan Agong (Supreme Head of State) is elected to a five-year term. Nine hereditary rulers from the Malay States form a Council of Rulers who will determine the next Agong via a secret ballot. The position has to date been de facto rotated amongst the State rulers, originally based on seniority. Additionally, the Malaysian state of Negeri Sembilan is itself an elective monarchy, where the Yang di-Pertuan Besar of Negeri Sembilan is selected by a council of ruling chiefs. The ruling chiefs themselves are elected by the chieftain. Male candidates are determined based on matrilineal clan. The system was partially the basis for the federal monarchy. The Sultan of Perak is selected from amongst the most senior male princes descending from the 18th Sultan of Perak, Sultan Ahmadin. The Sultan, Raja Muda (Crown Prince), and Raja Di-Hilir (Deputy Crown Prince) are selected by the Dewan Negara of Perak. A son of the reigning Sultan cannot become Raja Muda if there is a more senior prince descendent from the previous Sultan; this is possible should the senior prince relinquish his right to become Raja Muda. Samoa was established as an elective monarchy upon its independence in 1962. The Constitution of Samoa stipulates successors to the two original heads of state, Malietoa Tanumafili II and Tupua Tamasese Mea'ole, who were one of the four paramount chiefs (Tama-a-Aiga), are to be elected for five-year terms by the Fono, the Samoan parliament. Articles 18 and 45 of the Constitution provide, respectively, that any Member of Parliament may be elected head of state, and that any Samoan citizen may be elected to Parliament, although 47 out of the 49 seats in the Fono are reserved for matai, or chiefs (the other two are reserved for non-Samoans). Thus Samoa might possibly be considered a parliamentary republic; however, the head of state is still referred to as "His Highness", nor does the Constitution expressly declare that the form of government has been changed. The incumbent as of 2018, Va'aletoa Sualauvi II, is also one of the four paramount chiefs. Andorra could be considered a semi-elective principality. Andorra's two heads of state are Spain's Bishop of La Seu d'Urgell and, since 1589, the king of France. As the French monarchy has long since been eliminated, the position of co-prince of Andorra falls to the democratically elected President of France. However, the Andorran authorities or people have no say in the election of the President of France, leaving Andorra in the unique position of having a monarch who is democratically elected by the citizenry of another state. Swaziland/Eswatini has a form of quasi-elective monarchy. In Swaziland, no king can appoint his successor. Instead, the royal family decides which of his wives shall be "Great wife" and "Indovukazi" (She-Elephant / Queen Mother). The son of this "Great Wife" will automatically become the next king. The eldest son is never appointed successor as he has other ceremonial roles. Nigerian traditional rulers (or "royal fathers", e.g., the Obas, Ezes and Emirs) are usually chosen by a council of kingmakers. The cacique of the Ngöbe people of Costa Rica and Panama is appointed for life by a council of 13 elders. The latest election was in 2013 after the death of the previous cacique at around 100 years-odl. Current cacique is Costa Rican-born Pedro Palacios, son of the previous cacique Pedro Bejarano. Saudi Arabia's throne, while hereditary, is not determined by a succession law but rather by consensus of the House of Saud as to who will be Crown Prince of Saudi Arabia; consensus may change depending on the Crown Prince's actions. Since 2007, the process of establishing the consensus of the House has been institutionalized in the form of the Allegiance Council, comprising the most powerful senior princes, which has the power to disapprove the King's nominee for Crown Prince and substitute its own by simple majority vote. In effect, this makes the Saudi monarchy elective within the House of Saud, as the king's eldest son has not become Crown Prince since the death of King Abdul Aziz Ibn Saud in 1953. The Maori King Movement in New Zealand chooses a Maori monarch, elected by the kaumatua of various New Zealand iwi (tribes). However, every Maori monarch to date has been succeeded by his/her son or daughter, making the position hereditary in effect. Wallis and Futuna (territories of the French Republic) have traditional heads of the three regions who are elected. ^ "The Emperor: Qualifications". The Holy Roman Empire. Heraldica. ^ Sire, H.J.A. (1994). The Knights of Malta. Yale University Press. p. 221. ^ Noonan Jr., James-Charles (1996). The Church Visible: The Ceremonial Life and Protocol of the Roman Catholic Church. Viking. p. 135. ISBN 0-670-86745-4. ^ In Early Irish laws and institution (1934) Eoin MacNeill stated that, according to the annal evidence, tanistry originated only about a century after the Anglo-Norman invasion, p. 148. ^ Hamilton, Alexander (1962). The Papers of Alexander Hamilton, Volume 9. New York: Columbia University Press. ISBN 0-231-08903-1. ^ Blockmans, Wim; Krom, Mikhail; Wubs-Mrozewicz, Justyna, eds. (2017). The Routledge Handbook of Maritime Trade around Europe 1300–1600: Commercial Networks and Urban Autonomy. Routledge History Handbooks. Taylor & Francis. ISBN 9781315278551. Retrieved 2017-07-18. The Pskov men invited princes to Pskov whose professional armoured cavalry was very important for a city that had constant wars with the Livonian Order. [...] The princely power grew during the fourteenth and fifteenth centuries while the prince himself usually was a protégé of the grand prince of Moscow. [...] However, the right that was especially valued by Pskov men was that to expel princes whom they disliked. ^ Parker, Geoffrey (2004). "8: Princes, Bishops and Republics: Cities and City-States in Russia". Sovereign City: The City-state Through History. Globalities Series. London: Reaktion Books. p. 124. ISBN 9781861892195. Retrieved 2017-07-18. From 1075 the people of Novgorod 'invited' the prince to take the throne and it is clear that the princes were now there only so long as they satisfied the Novgorodians and obeyed their laws. ^ Plokhy, Serhii (2006). "4: The rise of Muscovy". The Origins of the Slavic Nations: Premodern Identities in Russia, Ukraine, and Belarus. Cambridge: Cambridge University Press. p. 137. ISBN 9781139458924. Retrieved 2017-07-18. On the Novgorod and Pskov communities' practice of inviting princes from the Grand Duchy of Lithuania, see Anna Khoroshkevich, 'Istoricheskie sud'by belorusskikh i ukrainskikh zemel' v XIV – nachale XVI v.,' in Vladimir Pashuto, Boris Floria, and Khoroshkevich, Drevnerusskoe nasledia i istoricheskie sud'by vostochnogo slavianstva (Moscow, 1982), pp. 140–141. ^ "Elección de un cacique en tiempos modernos". Diario Extra. ^ "Brus malis se viste de fiesta tras elección de nuevo líder indígena". Actualidad CR. ^ "The Allegiance Institution Law". Royal Embassy of Saudi Arabia, Washington, DC. 20 October 2006. Retrieved 2 May 2011. Worsøe, Hans H. "Official Denmark – The Royal House". The Royal Danish Ministry of Foreign Affairs. Archived from the original on 2009-02-27. Retrieved 2008-01-02. "The Noble Republic, 1572–1795". Poland – The Historical Setting. Polish Academic Information Center, University at Buffalo. Archived from the original on 2011-06-04. Retrieved 2008-01-02. Jędruch, Jacek (1998). Constitutions, Elections and Legislatures of Poland, 1493–1993. EJJ Books. ISBN 0-7818-0637-2. Archived from the original on 2006-05-05. Retrieved 2008-01-02. "Norway's elective monarchy". The New York Times. November 16, 1905. Retrieved 2008-01-03.